Out in the barn, Mike is writing a letter to Woody, trying to explain his sudden disappearance and everything that’s gone down with his family. Mike says they’re all going through a rough patch, especially Leo, and they’ve been having a hard time bouncing back. Out by the creek, Alopex spies on the pensive Leo. Raph sneaks up behind her and pulls her aside, warning her to stay away from his family. Alopex explains that she feels a kinship with Leo, as they were both manipulated by the Shredder. More so, she wanted to thank him for standing up for her earlier. Lastly, she tells Raph that she wanted to try and help Leo through his dilemma, as she also knows the value of family since she lost hers. As Alopex storms off, Raph appears to have second thoughts about his actions. In their loft in the barn, Donnie changes the bandage on Splinter’s broken leg. He tells his sensei that he feels the information on the Technodrome he’s uncovered in Professor Honeycutt’s journal is vital, but is frustrated that without any tech, he can’t do much with it. Splinter, though, is miles away in thought and barely registers a word of what Don is saying. Leo, meanwhile, is trapped in a nightmare, being chased by demonic versions of the Shredder and Karai. The spirit of Tang Shen appears to him and drives the visions away. Leo tells her that he’s still confused; his memories are hazy and he’s having trouble putting his head back together. 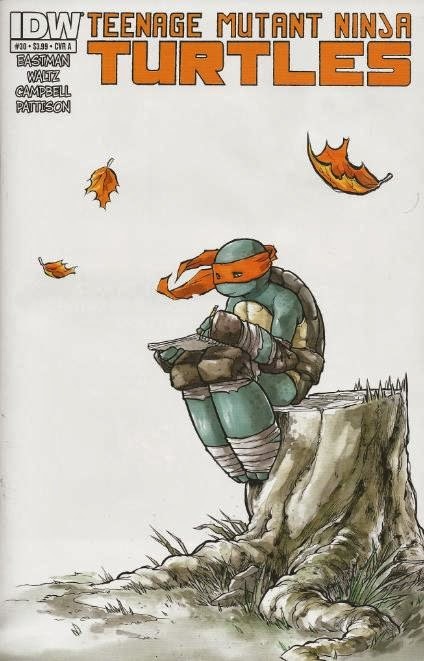 He knows that Splinter and the Turtles are his family, but they feel like strangers. Tang Shen tells Leo that the path to recovery is before him and he need only to tread it slowly. Leo asks her to stay, but she says she is needed elsewhere and drifts away. Over in the farmhouse, April and Casey get the lowdown from Mrs. O’Neil. April’s mom explains that her husband used to be a classified research employee at Stockgen, working on a substance called “ooze”. After Mr. O’Neil was injured, Stockgen offered to foot all his bills, provide a pension and extend April an internship offer. Having been an investigative journalist, these sorts of things tripped alarms in her head, but she didn’t want to risk her husband’s recovery by pursuing the issue. Mrs. O’Neil then gives April her husband’s old laptop from when he worked for Stockgen. She says she can’t make heads or tails of the scientific data stockpiled in it, but maybe April can crack it. Out in the woods, Donnie wakes Leo from his dream. Leo’s attitude has softened and he recognizes Donnie. Leo tells Donnie about speaking with their mother in his dream and Donnie admits that after all they’ve been through, he’s become less skeptical about the supernatural. He asks Leo to come back to the barn with him and help him out with the Technodrome research. He’s been trying his best to put it all together, but doesn’t think he can pull it off. Leo assures him that if anyone can figure it out, it’s him. Meanwhile, Tang Shen appears to Splinter in his dreams. Splinter is ashamed to be seen by her, as he’s no longer human, but Tang Shen is not disturbed by his appearance in the least. Splinter tells her that he failed in his mission and that he has lost their eldest son. Tang assures him that what he feels is confusion, not failure, and that Leonardo is still with them. After telling him she loves him, Tang Shen vanishes and Splinter awakens. Mikey puts the finishing touches on his letter to Woody, ending on the hopeful note that even if things are at their worst, his family is too tough to let it bring them down. As a matter of fact, he has a surefire plan to bring everybody back together. Mikey summarily starts a bonfire out in the woods and begins roasting weenies and marshmallows. The smell draws the Turtles and Splinter from their various sulking places and they all gather around the fire as a family for the first time since they left New York. 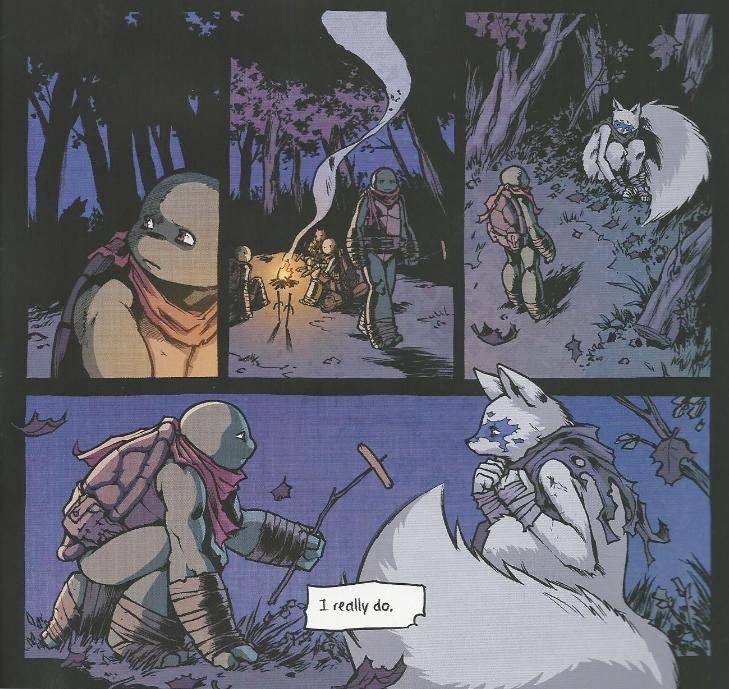 Raph sees the silhouette of Alopex brooding alone in the woods and extends an offer to join them. She accepts. Unbeknownst to the happy family, in the skies above lurks falcon-mutant Koya. She radios Karai and reports a confirmation of their target’s identities. Karai tells her to standby for reinforcements. *This story is continued from TMNT (IDW) #29. The story continues in TMNT (IDW) #31. *The events of The X-Files/TMNT: Conspiracy #1 take place between this and next issue. *Don found Professor Honeycutt’s journal in TMNT: UtromEmpire #1. *Koya first appeared (as a regular falcon and pet of the Shredder’s) in TMNT (IDW) #25. *This issue was originally published with 3 variant covers: Cover A by Campbell, Cover B by Eastman and Pattison, and Cover RI by Andy Belanger. This is essentially IDW’s take on the classic Mirage TMNT (Vol. 1) #11. While the framing device is much the same, the narrative has been adapted to the unique situations all the characters are now in and how they’re each coping with this predicament. It’s a classic TMNT story and if you don’t recognize it from the Mirage comics then you certainly recall its adaptation from the 1990 live-action movie. I remarked last review that the “exile to Northampton” is an essential and iconic Ninja Turtles story, and the whole journal gimmick is a staple of that experience (though I don’t think the 4Kids cartoon utilized it in their adaptation, did they?). We catch up with each character one at a time and that makes it pretty easy for me to categorize my thoughts for this review. Ahhhh, convenience. We’ll start with Leo. I’m glad to see that he’s recovering from his pouty attitude and that the angry, confused, rebellious phase is passing quickly. His arc during “City Fall” fell limp for me so if this aspect of the aftermath had been drawn out any longer, I probably would have started to lose interest. Then there’s Alopex who seems to be on her way to becoming this comic’s Ninjara. Her transition from enemy to ally has been much smoother than the other fox-woman’s, though I’m not all that sold on her kinship with Leo. Hindsight is 20/20 and I feel like if the IDW creative team had had this plotted out in advance, then they really should have laid the seeds during “City Fall”. Dark Leo was a member of the Foot Clan and fought alongside Alopex, but they never shared any dialogue or tender moments during that span of time. Her sudden longing to befriend and understand Leonardo doesn’t stem from a relationship forged during the time they were both manipulated into working for the Shredder, but because he said “leave her alone” once and threw a tantrum. It feels just a little shallow when the opportunity was there for it to be better reinforced. Heck, even a flashback to Dark Leo and Alopex sharing a conversation during the midst of “City Fall” would go a long way. Raph gets the short end of the stick in this one, as his whole narrative revolves around wanting to protect Leo from Alopex. While it shows that even after their words last issue, Raph is still looking out for his brother’s welfare, the problem is that we don’t see him internalizing the situation in any other way; his angst is basically an extension of Leo’s. But hey, there’s only so much page space. 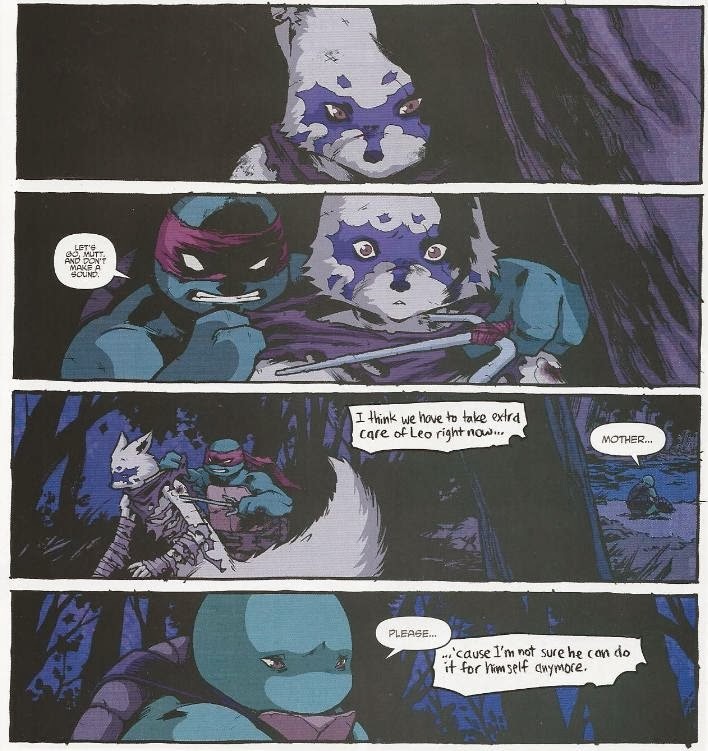 Not even the great TMNT #11 was perfect; it cut out Splinter’s narrative completely. As for Raph coming to terms with Alopex, I guess that’s a cue for all the ‘shippers out there to start their engines. RaphxAlopex or LeoxAlopex? God almighty, I do not care. Donatello, Splinter and Tang Shen I want to talk about together. In the past, the Tang Shen dreams and visions have been left vague, having only begun after Leo was subjected to Kitsune’s mind-fuckery. So they could very well have been all in his head. With this issue, however, Waltz solidifies that it is, in fact, a spirit and not a hallucination (as she proceeds to cross from Leo’s dream to Splinter’s), putting to rest any doubts about the place for supernatural elements within this continuity. And right after that’s established, guess what? Donatello comes to terms with the existence of the supernatural and discards his previous skepticism. Perfect timing in that regard, as now that we know spirits and such exist in this universe it would have been frustrating to see Donatello continue on with his skeptic routine. April and Casey’s narrative was a lot of exposition that didn’t boil down to much content (April’s dad worked for Stockgen and Mrs. O’Neil was a reporter). I am wondering how many more artifacts encrypted with vital info about the villains and their schemes these characters can collect, though. Don just found Professor Honeycutt’s journal detailing the Technodrome project while April just received a laptop stuffed with Stockgen ooze data. I’m guessing April and Donnie are going to pool their resources and figure out the whole Krang plot line, but it sure is lucky those characters both received convenient payloads of vital information at roughly the same time. But then, it’s also a comic book so shut up, Mark. And then there’s Mikey, who tied all the narratives together. Michelangelo’s whole deal revolves around unbridled enthusiasm and indefatigable optimism, so I really enjoyed his "clever" plot to bring the whole family back together. His narration starts out battered and worrisome, but he quickly turns it around at the end and reminds us why he’s so important to the group’s dynamic, even if a lot of folks find him obnoxious. Also, new mutant henchwoman for the Foot to replace Alopex. That didn’t take long. Anyhow, this has been exactly the kind of catch-up with the characters I was looking forward to. Ross Campbell boasts some more excellent pencils that fit the somber and introspective mood of this arc, but I have to give major props to series colorist Ronda Pattison. Her work has been superb, particularly the nightmare/dream sequence Leonardo had, with those fierce blacks and reds on the nightmare followed by the soft, chalky look of the Tang Shen scene. Some really pretty stuff. but has it ever been explained why the turtles in the mirage comics all wear red ? No explanation that I've ever seen. Fans have postulated that the red bandanas are their "clan color", but that's just a fan theory. And since Snowkatt brought up bandanas, I've always wanted to know --and you might be the guy to ask-- is there a particular reason why the additional colors blue, purple and orange were used for the other three turtles? I understand that it's to help tell them apart, but have you heard of there being any significance for those particular colors being chosen & who they might've been chosen by? Thanks for the support, man! As for the bandana color choices, I don't believe there has ever been an official statement about why those colors were chosen. I don't have a link, but I recall someone asking Peter Laird on an "Ask Peter" column over at his blog and he said it might have been something the merchandising folks at Playmates came up with, but even he isn't certain. Not 100% on that, sorry. Exile to Northampton was used in the 4Kids cartoon, episodes 19 and 20. I know, my question was if their adaptation used the journal entry gimmick or not, since I couldn't remember. I guess I can go back and check easy enough. yes, it looks like there's going to be a love triangle there; as you said, whatever. also, we can only hope that alopex is just faking it, thus why it looks so far fetched her interest in Leo and turning to the good side. 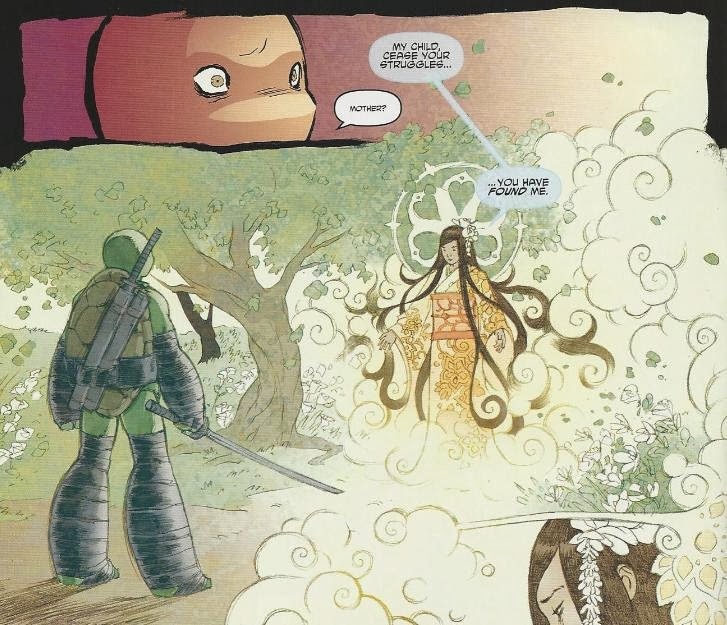 of course, if that would be the case, we could get the possible stream of events where she is faking her way into the turtles family, but at the same time growing to actually love them. then, she would betray them and raph would go from love to hate and then she would feel wrong and try to patch things up and yadda yadda yadda. Playmates made the decision to give each character a different bandana colour, as to sell more toys. That's the same reason why they got letters on their belts and why their skin tones differed within the original toyline (later mimicked by 4Kids on their show). and would the cover of tmnt 1 really have influenced his decision to make them all wear red ?